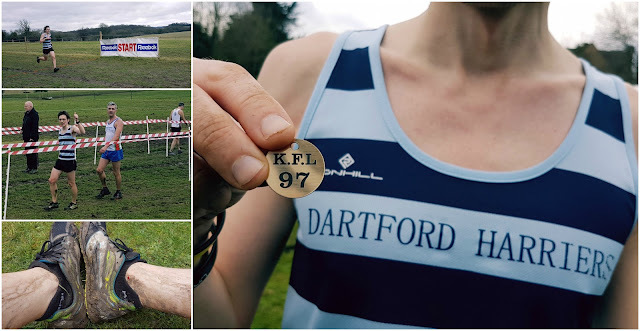 Race six of the 2017/18 Kent Fitness League season took place in the grounds of the Grade I Listed Nurstead Court in Meopham. The grounds here are used by equestrians and features a purpose built cross-country course as well as many other horse related facilities. So, in the pre-race briefing we were told that the horses had been out in one of the fields and had churned it up, I noted it but wasn't overly concerned. The horn sounded and we all flew off to test ourselves over one of the best cross-country courses in the league. A real bonus was that the weather had slight spring feel to it, so I didn't have to wear a hat, arm warmers or gloves. If you've read any of my previous posts (2014/15 and 2016/17) about this venue, you'll have a good idea what this course is like. If you haven't, you'll be pleased to hear that it has a bit of everything; uphills, downhills, mud, a water crossing, tree roots, branches, logs and bales of hay to jump over, forest paths, fields, open grass areas, and even some bomb craters! 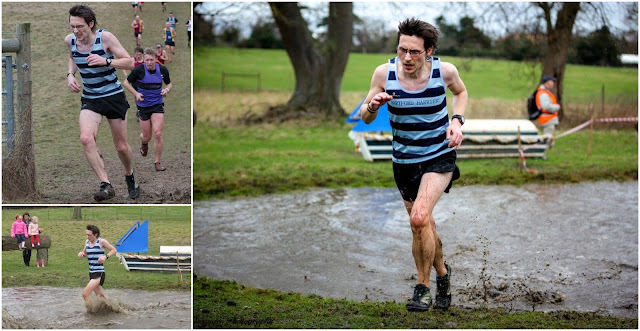 As soon as we headed off along the start/finish straight, it was clear that the course was going to be soft underfoot and by the time I reached the water crossing (800 metres into the course) I was already suffering. This could in-part have been due to not having a proper warm-up - you see, there were five portaloos available and the queue was really long when I arrived. Long story short, my warm-up lasted 2 minutes. So continuing around the first lap, I leapt over the bales of hay and then flew along the slightly downhill perimeter of the main horse shoe-jumping training field. Then I entered the woods - the twisty path was muddy, tree roots and logs were lurking everywhere. Through another field and then out onto a straight path which was caked in mud - I remember the first time I ran here and really struggling on the path. It was similar this time, but I was wearing spikes so coped ok.
After a short, sharp incline, I entered the muddiest of all fields. It wasn't just regular mud, it was churned up mud. Each footstep was a struggle and required vast amounts of energy to wade through - it was at this point I realised that my left shoe was a little loose. There was no way I was going to stop to re-tie the shoelace, thankfully it stayed attached to my foot for the rest of the race. Now into the second wooded section - the fun to be had in here is off-the-scale! The paths twist all over, the terrain goes up and down - it was like a muddy, slightly dangerous, rollercoaster track. At the end of this section, the bomb craters are found - three of them. I was totally knackered already, but I dropped in and powered out of each one in turn. A few more twisty paths and then it was time for the long, uphill, drag towards the end of the lap. At the top, I swung around and headed straight back down the hill to start lap 2. Strangely, despite feeling totally exhausted, with my arms seemingly just flapping around not under my control, I did manage to continue to catch and overtake quite a few other participants during the second half of the race. Water splash, hay bales, mud, downhill, uphill, and bomb craters all over again and it was time for the final stretch back along the opening path, and with that done, some serious recovery time was needed. I picked up 97th finish position, which I was expecting to be a little higher. But that was out of 404 runners in total, so it's still in the top 25% overall. I was a few seconds slower than the previous year, but I think the course conditions were worse this time around, so on balance I think it worked out ok. There were a few photographers out on the course whose photos I have used here, so I'm very grateful to Dawn Granger, Brian Pitkin, Eden Summers and my wife for getting some fantastic shots of the action.